Seeding is off to a slow start in some areas of the Prairies because of wet and cold weather and unharvested 2016 crop, but it is too early to push the panic button, say industry officials. Kevin Bender, vice-chair of the Alberta Wheat Commission who farms near Red Deer, is in uncharted territory with 1,200 acres of wheat and canola from last year still waiting to be combined. Seeding usually starts around the beginning of May in his area, and he doesn’t think it will be too far off the mark. “If it wasn’t for the crop we still have out from last fall, we’re not really out of the ordinary yet,” he said. Bender plans to intermittently seed the 2017 crop and combine what is left over from 2016. “We may leave some of the combining until late, especially some of the wetter land,” he said. That will change some of his seeding intentions. Land that was earmarked for fababeans and peas will likely be planted to cereals. Shannon Friesen, acting cropping management specialist with Saskatchewan Agriculture, said the same switch could take place in that province with pulses losing ground to barley and oats in waterlogged areas or where there is unharvested crop from 2016. She estimates that one to 1.3 million acres remains to be harvested in Saskatchewan. Friesen said farmers are getting into their fields a lot later than the last couple of years, when field work was happening in March and April. The last two years seeding was five to 10 percent complete by now. This year it is under one percent, but that is closer to normal. Many farmers in the southern portion of the province who are often seeding by late April can’t get into their soggy fields, but it’s better than the alternative. “We’ve seeded into dust before, so we’ll take it,” said Friesen. David Koroscil, manager of claim services with Manitoba Agricultural Services Corp., said most farmers in that province are usually seeding cereals by late April or early May. Crops such as soybeans and beans go in after the May long weekend. He said there are soggy areas, such as western Manitoba, where seeding will definitely be delayed, but there is nothing alarming about how spring is unfolding in other regions of the province. “It’s early enough that if we get a good week to 10 days of sunny, windy weather here, a lot of crop can go in,” said Koroscil. The final seeding deadline for cereals is June 20, so there is plenty of time to get the crop in the ground. 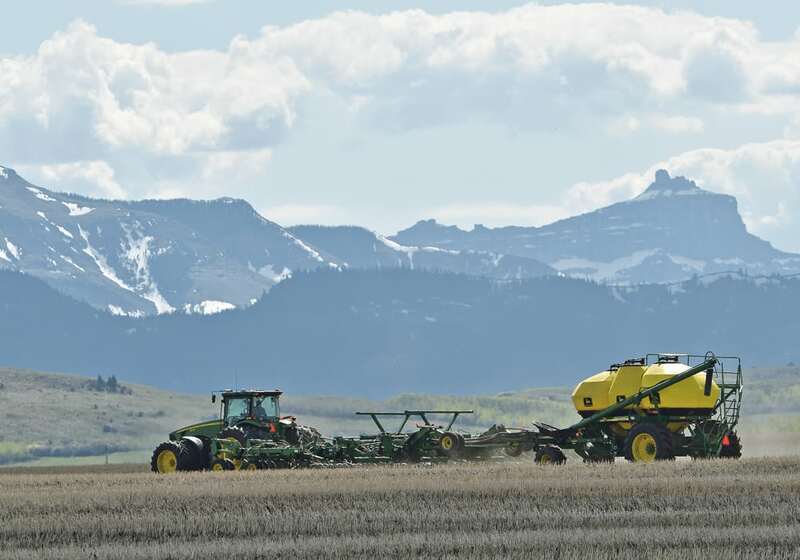 Bender believes seeding in Alberta will proceed at a normal pace with the exception of some of the province’s waterlogged areas, such as portions of the Peace region and the areas where a lot of the 2016 crop is still in the fields. “I think for the most part it will be on time unless the weather really turns nasty here for a month,” he said. That doesn’t appear to be in the cards, according to David Streit, meteorologist with Commodity Weather Group. The cool, wet weather pattern of April that has slowed the warming up and drying down of the soil is expected to moderate after the first week of May. Overall, May is forecast to have near to below normal precipitation. Saskatchewan is expected to be the driest of the three prairie provinces. Moisture and temperature are both anticipated to be near to below normal for the summer months. “Getting stuff to maturity is certainly a fear I would have looking at a seasonal outlook like this,” said Streit. It is super wet in the heart of the American Midwest, where some areas recently received up to 178 millimetres of rain over a seven day period. “It’s a pretty big setback as far as planting activity in the heart of the Midwest,” he said. The summer forecast calls for near to above normal precipitation and slightly below normal temperatures. Streit was feeling good about winter wheat prospects before the crop was bent over by last weekend’s snowstorm. He believes the U.S. spring wheat crop could lose ground to soybeans because it is wet in the Dakotas.